You want your obstacles to stay in place once you set them up, right? Right! But sometimes you need a little help keeping your carefully placed obstacles from getting knocked down or blown over. Whether it's the ordinary jostling of dogs speeding through a course, or even a gusty breeze, E-Z Sacks are the best way to keep everything where it belongs! 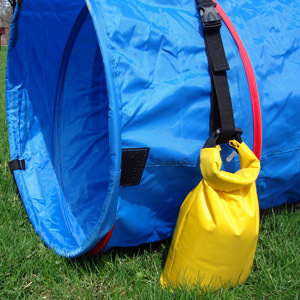 You may have seen something similar to these sold elsewhere as Tunnel Bags, Saddle Bags, Obstacle Sand Bags, Tunnel Holder Bags, or Tunnel Weight Bags. Bah. Boring! 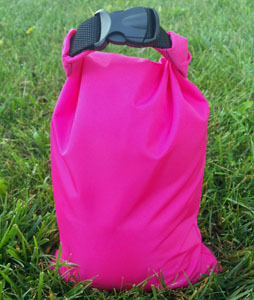 We call ours "E-Z Sacks" because they're just so darn easy - and affordable! 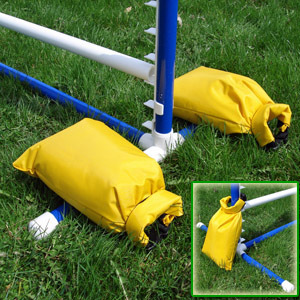 Use 'em with Jumps, Tire Jumps, Tunnels, Barrel and Chutes... whatever your obstacle, these small, economical sand bags make it easy to weigh your equipment down. Our E-Z Sacks have a unique design that allows you to fill the bag with any weighted material (such as sand). They're a 'snap' to fill, close, pick up, and move around. Color Options: Available only in either "Golden-Yellow" or "Hot Pink". Shipping: These items will have a shipping cost attached to it in the shopping cart, but if they are ordered with other items that have shipping costs, or ordered in multiples, the shipping may be adjusted lower at the time of order processing. To order, choose quantity & add to cart!